House Republicans including Montana U.S. Rep. Ryan Zinke voted Tuesday night to overturn a rule requiring Congress to calculate the value of federal land before transferring it to states or other entities, removing a significant barrier to limit lawmakers from ceding federal control of public lands. The provision, part of a larger rules package that passed by a vote of 233 to 190, dictates that transfers of federal land should be treated as having no cost to the federal government, therefore requiring no budgetary offset, even if the parcels generate revenue for the U.S. Treasury through logging or energy extraction. 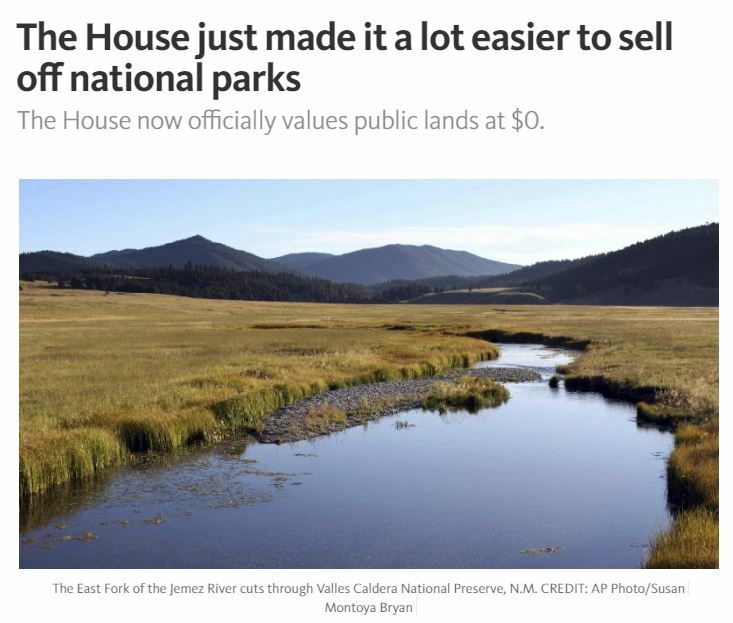 Currently, the Congressional Budget Office provides “scorekeeping” estimates to measure the costs of proposed public land transfers by evaluating the economic impacts of existing uses. While the idea of transferring federal public land to the states has figured prominently into the GOP platform because it returns management authority to surrounding communities, opponents caution that states without the resources to manage broad swaths of federal land would be forced to sell it off to developers. There are more than 27 million acres of federal land in Montana, encompassing about 29 percent of the state. The Forest Service oversees 17 million acres, mostly in Western Montana. 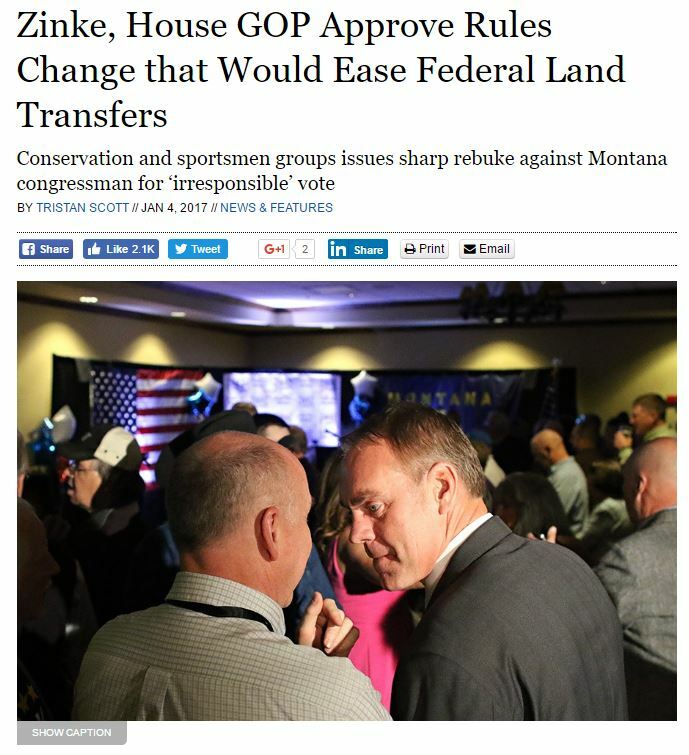 Zinke, Montana’s lone congressman, was recently tapped by President-elect Donald Trump as the nation’s next Interior Secretary and has opposed transferring management of federal lands to states’ control, even quitting his post as a member of the GOP platform-writing committee after the group included language that would have made transferring federal land ownership to the states a priority. He characterizes himself as a “Teddy Roosevelt” Republican and made his commitment to preserving America’s public lands a centerpiece in his recent campaign for re-election. It’s no surprise, then, that Zinke’s vote in favor of the new rule prompted immediate backlash from the local conservation and outdoor recreation communities, whose advocates called it an about-face. Backcountry Hunters and Anglers decried the measure and strongly criticized House members who voted in support of it. The primary impact of the rules change is that it inhibits lawmakers from raising a budgetary point of order if a land transfer bill lands on the floor. Under current House rules, any measure that costs the U.S. Treasury money must be offset by budget cuts or another provision to replace lost revenue. Marne Hayes, executive director of Business for Montana’s Outdoors, joined in criticizing the House vote. Following the House vote, both U.S. senators from Montana stated their continued opposition to transferring federal lands to the states. “I continue to strongly oppose the transfer of federal lands to the states while fighting to improve the management of those lands,” Republican Sen. Steve Daines stated. State Democrats likewise joined in the chorus chastising Zinke’s vote. “Montana’s hunters and anglers won’t soon forget this vote and we will continue to hold Congressman Zinke accountable as he asks for the nation’s trust in serving as Secretary of the Interior,” said Nancy Keenan, executive director of the Montana Democratic Party.